Walking down our driveway I observed something on the ground that looked like it had been left by a wallaby after a big night out (see picture left). After flicking through the books, I decided it looks like a slime mould. 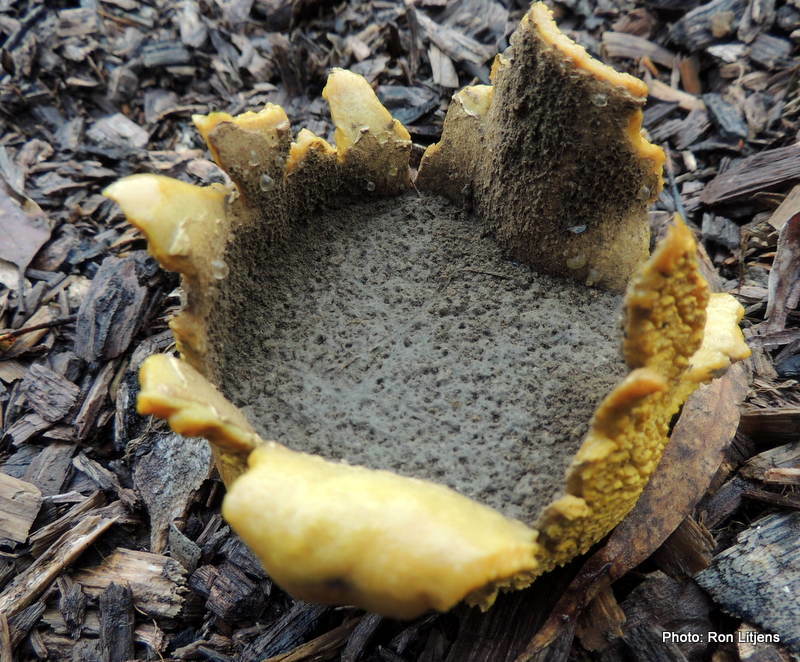 Slime moulds fit into neither flora nor fungi categories. They have characteristics of both animals and fungi and exist as single-celled organisms that feed on other microorganisms living in dead plant material and fungi. 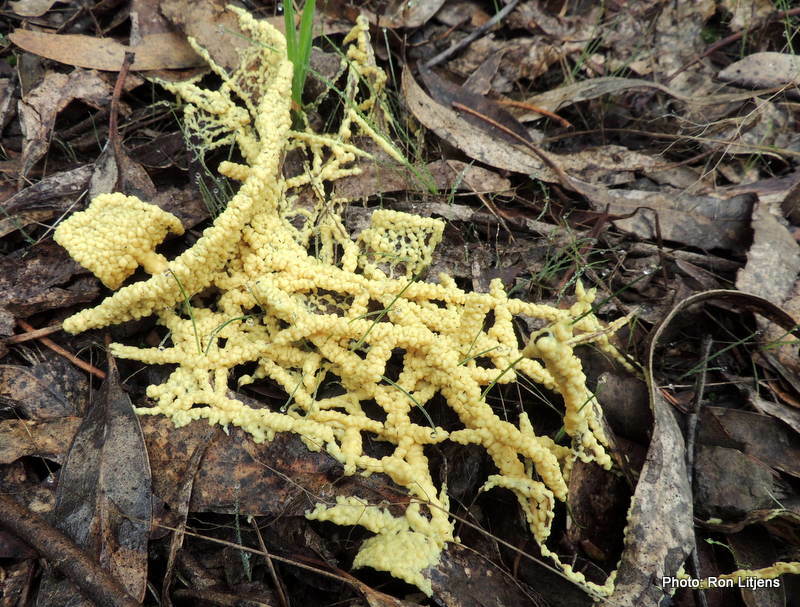 However in times of stress, if the food supply is scarce or if the temperature is unsuitable, slime mould organisms cluster together to form a larger, visible ‘blob’. This mass can then move towards light or hunt for food. 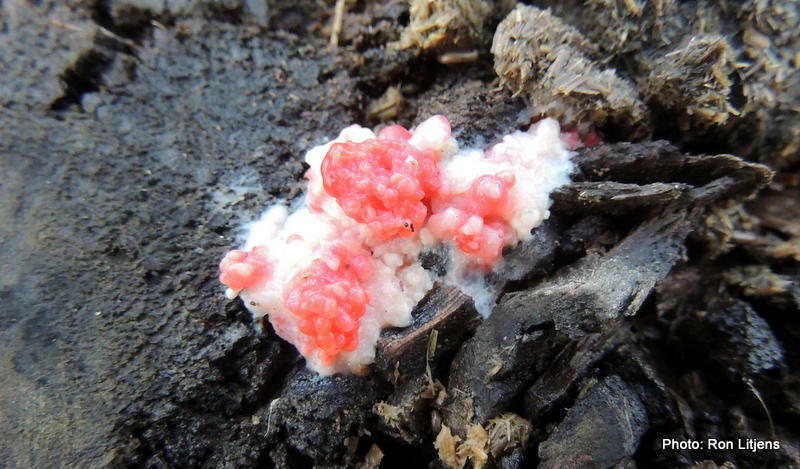 Slime moulds reproduce by producing spores. When mature, the spores are dispersed and new ‘amoebae’ are formed. Along our road recently I noticed this orange slime mould (pictured right). The fungi in our area have been getting a fair bit of airplay on this blog at the expense of the flora. 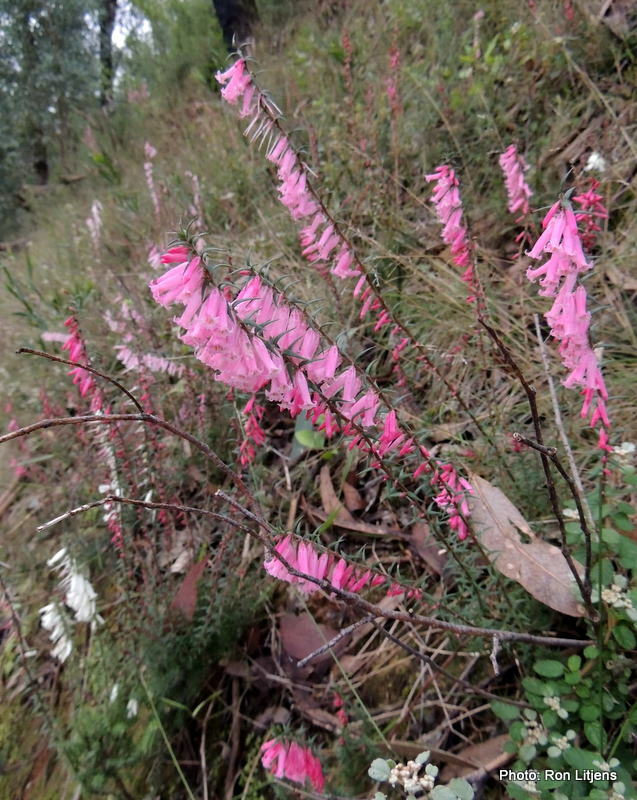 One plant (pictured left) putting on a colourful display at the moment is the Common Heath (Epacris impressa), Victoria’s floral emblem. The scientific name (as always) comes from Greek and Latin words. Epi is Greek for upon and akris is Greek for hill. This refers to the plant’s familiar habitat on hillsides. The Latin word impressa means indented and refers to the external depressions at the base of the floral tube. In the picture below those depressions can be clearly seen. Before the ’09 fires when the road-sides were not mowed so frequently (if at all), heath could be seen in abundance along the Yea–Whittlesea Road all the way up the Whittlesea hill. It is not that obvious there anymore. However parts of Kinglake National Park and Mount Disappointment State Forest at the moment are carpeted in these flowers. If I make a note of all my sightings of this plant is that a Heath Ledger? If you live in an area long enough you get familiar not only with the species that exist in your space but also their size and form. 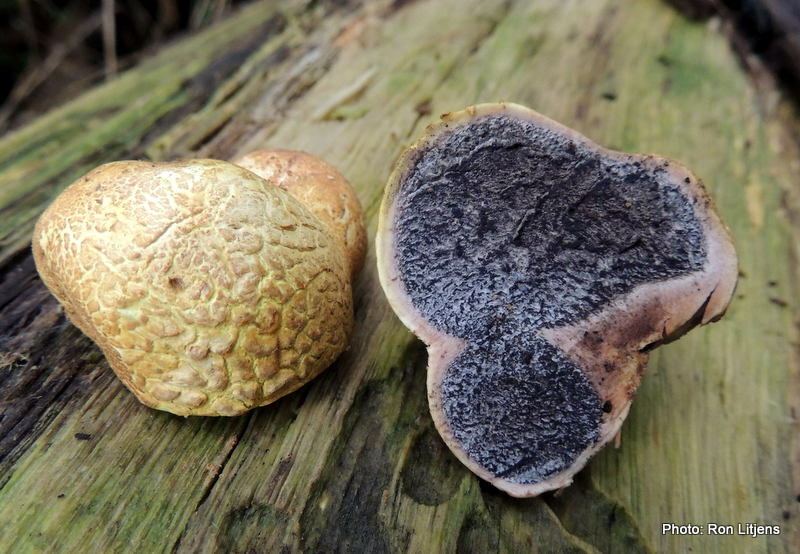 Take Puffballs or Earthballs (Scleroderma sp.) for example. If the scientific name has a slightly medical sound to it, it is because scleroderma is a disease causing hardening of the skin. The term originates from two Greek words, skleros meaning hard, and derma meaning skin. The term is also the genus of this group of ‘hard-skinned’ puffballs. Puffballs are a type of fungi that produce spores internally. If you cut open an immature puffball (see picture above), the middle is filled with ripening dark brown spores. This mass is called the gleba and in scleroderma fungi it is slightly purple. When ripe, the skins splits (pictured right) and the spores are released (pictured below). 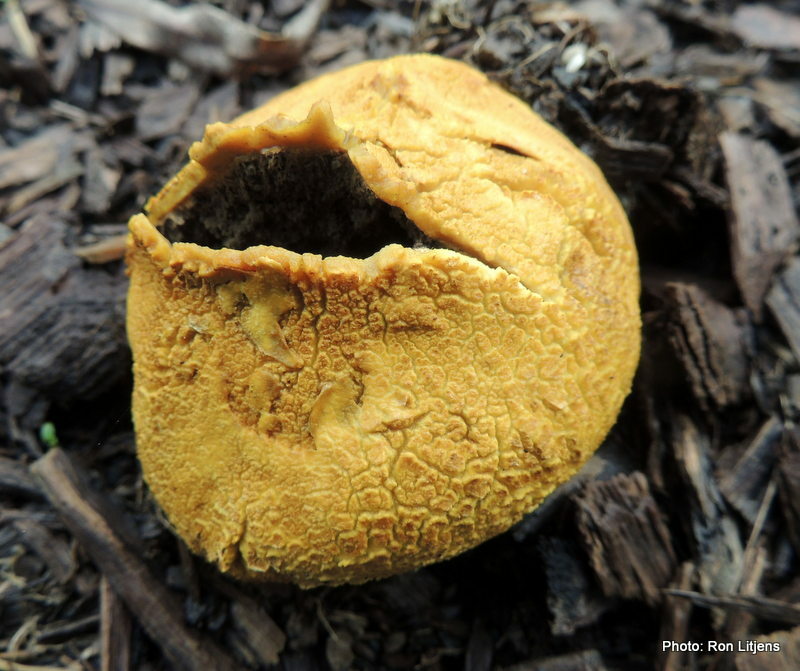 As kids we used to wait until the puffball was almost ripe and then kick it, releasing a huge brown cloud of spores – not that I would advocate that method of spore dispersal these days. The puffballs on the rocky slopes of Junction Hill are somewhat smaller than a table tennis ball in size – hardly worth the effort to kick at all. 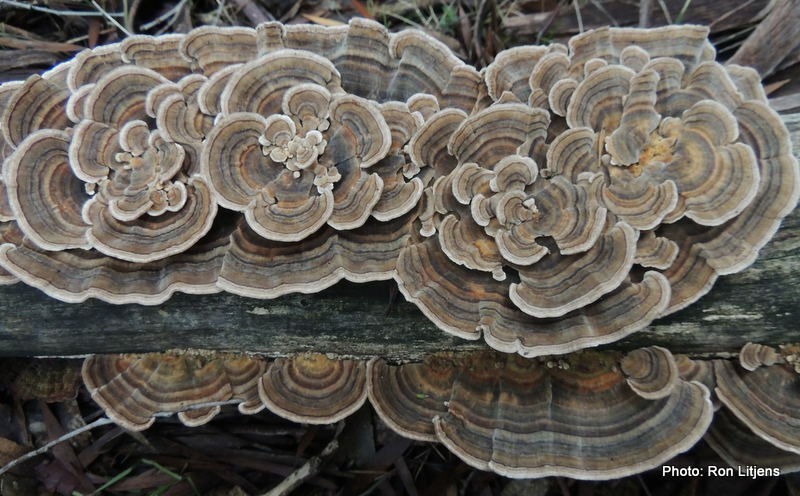 Last Sunday we joined the Kinglake Landcare Group and the Field Naturalist Club of Victoria on one of their Fungi Forays, this time in the Jehosephat Gully section of Kinglake National Park. Some of the puffballs in this area are bigger than tennis balls. Given the World Cup is in full swing I’d like to say they were as big as soccer balls, but that would be an exaggeration. These fungi were impressive in size, nonetheless. So, Kinglake has thicker fogs, heavier rains and now, bigger puffballs than Flowerdale. Personally I prefer less fog, even if our puffballs are smaller. 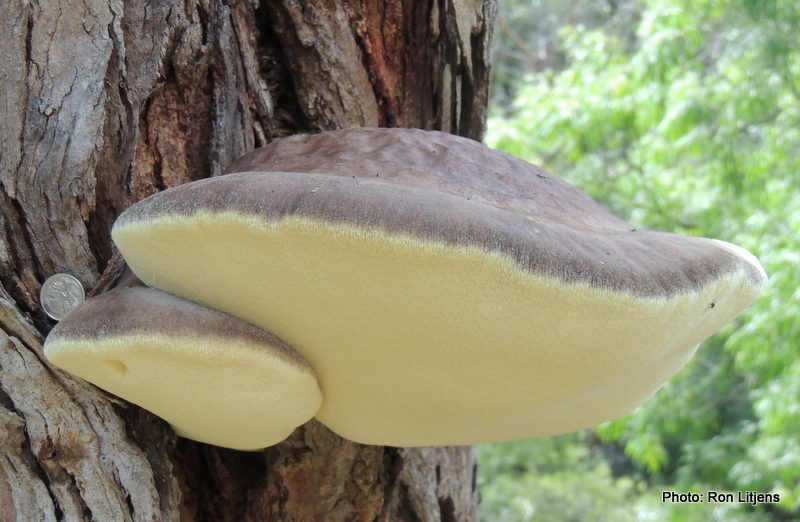 The appearance on the ridge above our house of a group of Australia’s largest terrestrial mushrooms, the Giant Boletes (Phlebopus marginatus) was reported last month. 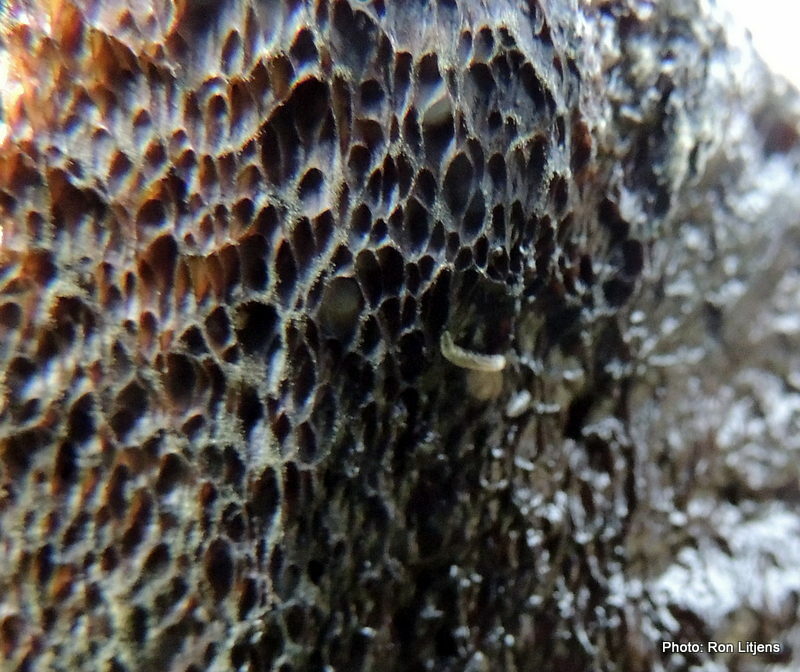 What was also predicted was their imminent demise due to the patronage of the Fungus Fly (Tapeigaster sp). The fly lays eggs on the mushroom and the hatched larvae (seen in the picture on the left if you really look carefully) tunnel through the mushroom body, quickly decomposing it. 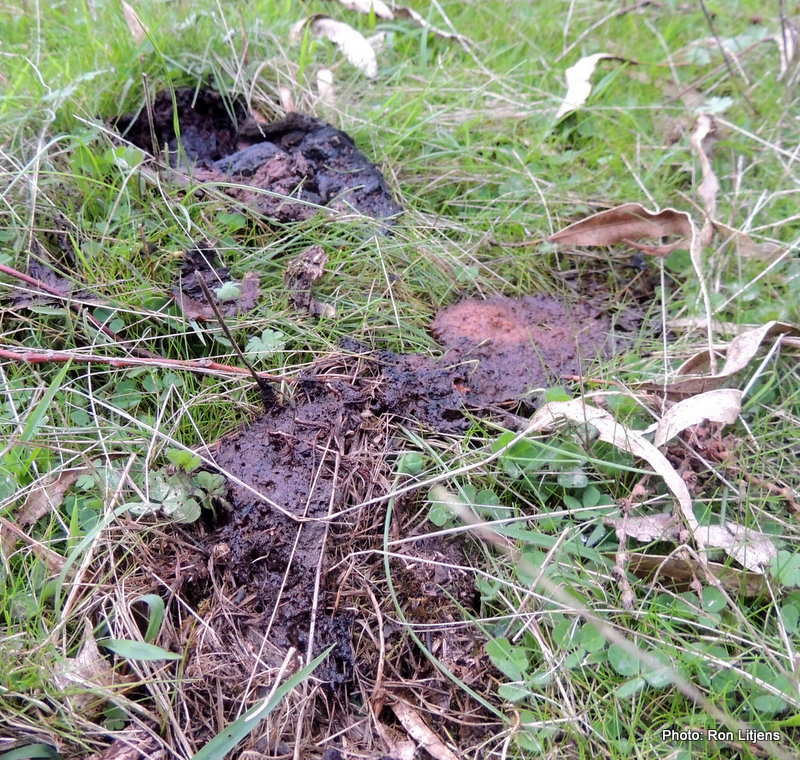 In the space of about 15 days the mushroom collapses from the robust fruiting body to a slick of ooze on the grass (pictured below) — that is, if the possums, wallabies, wombats or kangaroos don’t get to it first. It’s tough being a mushroom. If the saying play hard, die young has any credence in the mushroom world, these boletes must play really hard. Their demise is certainly swift. … a variation on a famous line from a famous movie. The answer to the question in this case is “Yes”, White Punk (Laetiporus portentosus) to be exact. 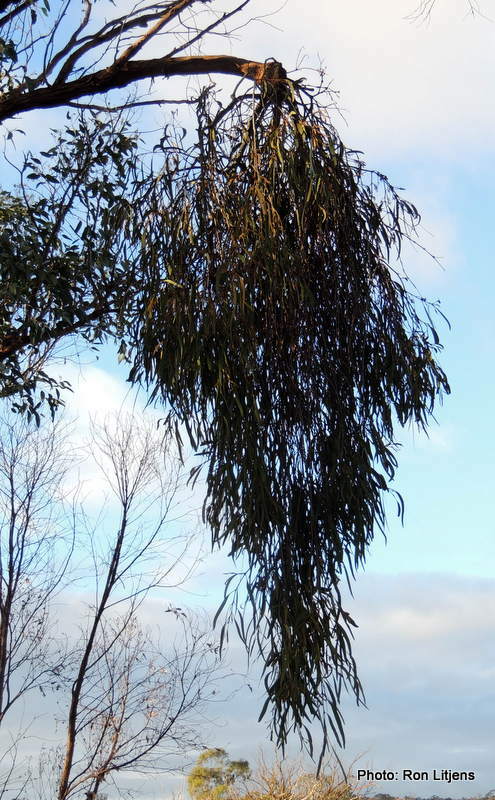 On the side of our driveway is a massive Long-leaved Box (Eucalyptus goniocalyx). At the beginning of winter each year a White Punk fungus grows from the same place on the trunk (see picture left). 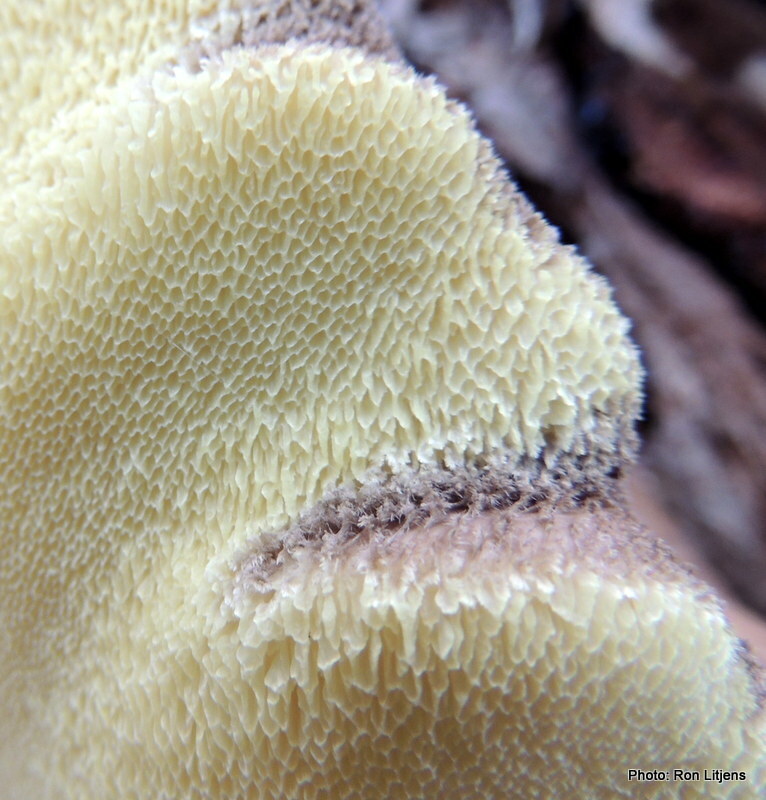 White Punk is a polyporous fungus, meaning that the visible fruit (equivalent to a mushroom) consists of a honeycombed series of vertical tubes or pores that open downwards (pictured right), attached beneath a supporting layer. The top surface has a velvet-like texture. The inside of the tube walls produce the spores (seeds). The spores are dropped from the tubes when mature. The fungus itself lives within the tree. It feeds on and eventually breaks down the live wood, causing White Rot. The life of the visible fruiting body is brief. Fungus Flies (Tapeigaster sp.) (click HERE for related blog) are already clustering around the pores. They produce larvae that tunnel through the fruiting body. If the Fungus Fly doesn’t get it the possums will, based on the experience of previous years. 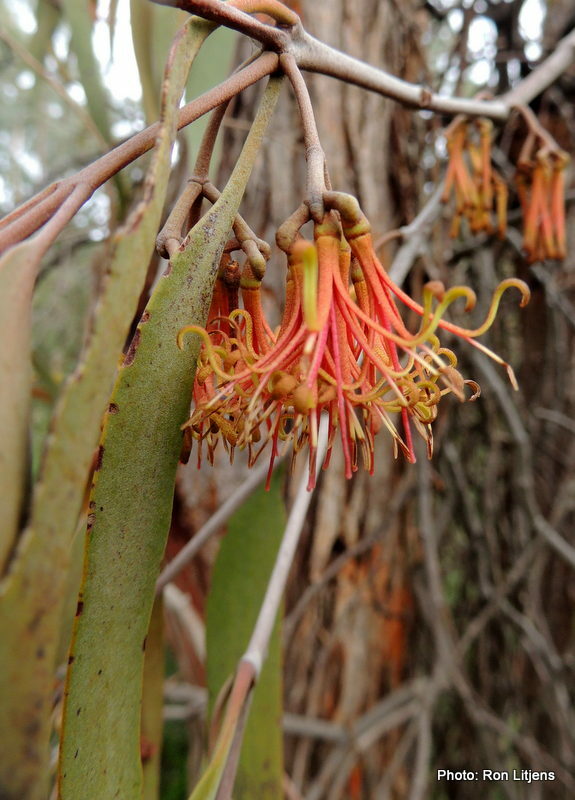 It has been suggested that this fungus provided a food source for Aboriginal people. It was also used as a tinder to carry fire around. It almost sounds like the first ready-cooked meal.